In the past twenty years, many parts of the African continent have experienced profound changes, which have led the emergence of new social and political settings. The notion of heterarchy (as opposed to the hierarchical representation of the state as standing above and disciplining other power groups within the society) seems to be more appropriate to describe the current plurality of competing power foci together with the mutable and unstable intertwining of state and non-state actors that emerges from the case studies from Kenya, Somalia, Congo, Chad, Gambia, Ghana and Mozambique that are discussed in this volume. In these circumstances, the expression beside the state, which the authors chose as the title of this volume, has a double significance. First and foremost, it highlights forms of political organization and leadership that develop alongside the state, and sooner or later end up by either sustaining its apparatus and policies or appropriating its sovereignty by processes of informal privatization. At the same time, the term beside points to a need to discuss under which circumstances and for how long such processes of power building create viable alternatives to the dominant power and organization of the state. Beside may then become below, as the state reasserts its verticality by disciplining or suppressing alternative forces, or beyond, when the powers that develop at the margins of the state, and complement its power, eventually open up innovative and unexpected spaces for political organization and mobilization. The emphasis is on the appearance of new figures of power, be they non-governmental and community-based organizations in Kenya and Chad, Somali returnees from the diaspora, or the persistence and vitality of neo-traditional political actors, whether they are chiefs in Mozambique or Ghana, religious scholars in Gambia or elders shaping the autonomous government of Somaliland. Afrikas „emergent powers“ sind Ausdruck einer sich vom westeuropäischen Staatsmodell unterscheidenden Raumordnung. Was bedeuten also Afrikas neue soziale Räume und die Parallelität von Raumordnungen für diese vernetzte Welt, in der wir heute leben, und für deren beibehaltenes Selbstverständnis von einer intenationalen Staatengemeinschaft? Antworten auf solche Fragen zu geben wäre selbstverständlich über das Vorhaben dieses Sammelbandes hinausgegangen. Diese Frage zu stellen verdeutlicht aber, wie relevant die von Alice Bellagamba und Georg Klute vorgelegte Auseinandersetzung mit Afrikas neuen (und alten) politischen Kräften bzw. Machtformen neben dem Staat ist – für eine Perspektive auf Afrika jenseits von Scheitern, Abweichung und Kollaps, für den internationalen Umgang mit Afrikas Herausforderungen und für die Frage der Positionierung von Afrika (von Afrikas neuen sozialen Räumen) in der globalen Ordnung. Die Herausbildung alternativer Machtzentren in afrikanischen Staaten wird überwiegend entweder als Substituierung oder als Abweichung von einer eurozentrisch gedachten Staatlichkeit verhandelt. Um beide Argumentationsweisen zu überwinden, führen die Herausgeber das Konzept „beside the state“ ein, mit dem ein Kontinuum an sozialen Beziehungen zwischen staatlichen und nichtstaatlichen Akteuren umfasst werden soll. Eva Range in Zeitschrift für Politikwissenschaft, online: 3.3.2009, pp. Plus accessible, un article sur la reconnaissance par le FRELIMO du rôle de la chefferie en 2000, soit près de 25 ans après qui’il l’avait vourée aux gémonies, se trouve dans BESIDE THE STATE. Son auteure danoise qui a étudié pendant plus d’un an la situation dans la province du Manica semble assez sceptique sur la marge de manœuvre que l’Etat accorde à ces personnages qui lui servent de courroies de transmission dans un système qui reste, selon elle, dirigiste et héritier du centralisme colonial et autoritaire postérieur à l’indépendance. 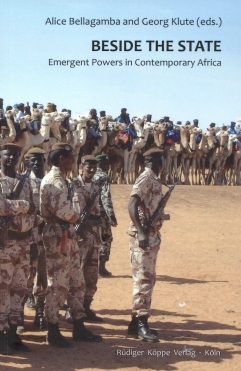 Le livre concerne également les lecteurs intéressés par le Somaliland, le Congo, le Tchad, la Gambie, le Sénégal, le Ghana et le Togo. In sum, this book provides a fresh look at politics in Africa. We have to relinquish the idea of state, including the modern state, as a clearly bounded entity or definite institutional arrangement. Rather, developments seemingly leading to parastatal structures beside or beyond the state turn out rather to be outflows of strategies by the very state itself, in particular in the case of the ‘deep state’, or again results of strategies to form competing or alternative state structures, as the cases of the eastern DRC or Somaliland indicate. The mere lack of international recognition in the latter two cases does not imply they are not state structures. Similarly, it amounts to illusory romanticism, to see the various forms of indirect rule as alternatives to the modern state; rather, the concrete accounts show the close interaction between state actors of various levels, which also include ‘traditional’ power holders. Again, this does by no means amount to conceptually levelling down state institutions completely. Rather, it is vitally important to reach an understanding of how differential sources of legitimacy and efficiency are harnessed to specific means, interests and uses. The extended, and thereby differentiated and complex state is not a conceptual fix-all but remains a serious analytical challenge.